Most developed countries have innovation policies for green innovation. This paper examines the rationale for such policies, offers a typology of eco-innovation and develops ten themes for eco-innovation policy, which are: 1) the need for policy to be based on identified barriers, 2) preventing windfall profits, 3) specific versus generic support policies, 4) balance between policy measures and timing, 5) targeted spending in areas where innovation is needed, 6) missions, 7) strategic intelligence for innovation, 8) portfolios, 9) policy learning and 10) policy coordination and public-private interactions. Relevant cases are discussed and empirical information is provided. It is proposed that the ten themes serve as a framework for eco-innovation policy-making and policy evaluation. The research for this paper was partly funded by the European Commission, through the INNO GRIPS project “Analysis of Innovation Drivers and Barriers in Support of Better Policies”, DG Enterprise (work package 2 Socio-economic trends for innovation policy). The results of this work can be found in Arundel, A., Kanerva, M., Kemp, R. (2011) Integrated Innovation Policy for an Integrated Problem: Addressing Climate Change, Resource Scarcity and Demographic Change to 2030. PRO INNO Europe: INNO-Grips II report, Brussels: European Commission, DG Enterprise and Industry. I am grateful to the comments of two reviewers and those of Raimund Bleischwitz and Melissa Cox, which helped me to sharpen arguments. The paper also benefitted from discussions at the Innogrips workshop. I thank Serdar Türkeli for putting the ten themes in a comprehensive scheme. To do so is an intellectual achievement in its own right. 1Modern innovation policy has developed with experience over the past 20 years. Around the turn of the century it was heavily influenced by research by innovation scholars arguing that the focus of policy should be less on technical discovery and more on the national system in which innovation occurs, whose features shape interactive learning processes amongst innovation actors and the uptake of innovation in society (Lundvall and Borras, 1998; Mytelka and Smith, 2002; Edquist, 2004). This was followed by calls to build and organise technology innovation systems for green energy technologies (Jacobsson and Johnson, 2000; Hekkert et al., 2007; Bergek et al., 2008) and creating strategic intelligence for research and innovation through the use of foresight, technology assessment, benchmarking and demand articulation (Smits and Kuhlmann, 2004). 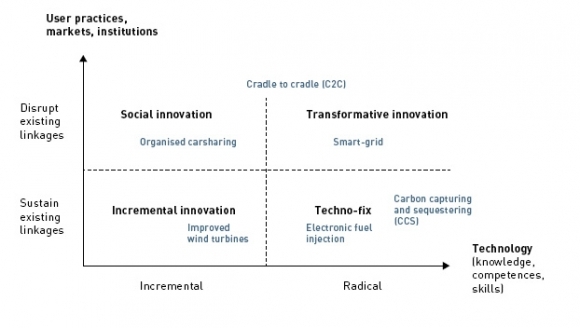 With the help of new innovation paradigms (described in Remøe, 2008) and dedicated evaluations, innovation policy grew out of technology policy which was primarily oriented towards military, civil engineering and energy technologies. Eco-technologies are a beneficiary of the greater attention to innovation for the manufacturing and service sectors; all EU countries have a number of policies for eco-innovation (Kletzan-Slamanig et al., 2009). Over the course of 50 years, innovation policy has been characterised by shifting paradigms which did not fully replace each other but layered upon each other. The paradigms are: mission-led support for military technologies and civil engineering technologies; policies to improve the “national system of innovation”; and a new mission-led approach with an orientation to technologies viewed as crucial for coping with new societal challenges such as demographic change (aging population), growing health costs, environmental sustainability, or energy/resource security (Gassler et al., 2008, p. 203). Borrás (2009, p. 1) observes a widening and deepening of innovation policies, in the sense that “governments are becoming more pro-active in using deeper and new forms of policy intervention and in expanding their areas of involvement in order to accomplish large socio-economic goals”. Eco-innovation is a prime candidate for “new mission” policies, to deal with (interrelated) societal challenges of climate change, resource efficiency and energy/resource scarcity. 2Between countries there are significant differences. Over half of public R&D in the USA goes to defence, compared to 11% in Germany, 30% in France and 40% in the UK. In Germany, 65% of public R&D is for measures which do not fall into the categories of defence, space and key technologies (Gassler et al., 2008, p. 213). 3The focus of this paper is on the rationales for eco-innovation policy and their implications for instrument choices and effective governance. The paper draws on the literature on effective governance of innovation (Smits and Kuhlmann, 2004; Kaiser and Prange, 2005; Braun, 2008; Borrás, 2009) and the more specialised literature on eco-innovation policy (Faber et al., 2008; Kemp & Zundel, 2007; Kletzan-Slamanig et al, 2009; OECD, 2011). The contribution is both empirical and theoretical. The structure of the paper is as follows: section 2 defines eco-innovation; section 3 investigates the policy rationales for innovation and eco-innovation, where we will see that there are two rationales (market failure and system failure); section 4 describes EU policies and strategies for the support of eco-innovation and provides information about Member State policies for eco-innovation; section 5 develops ten themes for eco-innovation policy; and the final section draws conclusions. 5Whether or not an innovation is an eco-innovation depends on whether the innovation on a life cycle basis is less environmentally harmful than the use of relevant alternatives. The innovation can be less environmentally harmful by using fewer resources, using less toxic material, being less polluting through the use of special or different process steps, and by not relying on the use of fossil fuels. Besides the environmental gain, there should be an element of novelty, either from the development point of view or an adoption point of view. According to the Oslo Manual(OECD, 2005), innovation is defined as the implementation of a new or significantly improved product (good or service), or process, a new marketing method, or a new organizational method in business practice. 6The OECD makes a distinction between innovations new to the world and those new to the adopter. Eco-innovation is the production, assimilation or exploitation of a product, production process, service or management or business method that is novel to the organisation (developing or adopting it) and which results, throughout its life cycle, in a reduction of environmental risk, pollution and other negative impacts of resources use (including energy use) compared to relevant alternatives. Eco-innovation is innovation that reduces the use of natural resources and decreases the release of harmful substances across the whole life-cycle. 9From this, two important things follow. First, that all new processes that are more resource efficient are eco-innovations. Anything is an eco-innovative solution as long as it is more environmentally benign than “relevant alternatives”. The relevant alternative may be the technology in use in a company or the normal technology in a sector (for example, gas or coal burning stations in the case of electricity generation). It does not have to be the best option available; innovations in coal burning technology would qualify as eco-innovation if they reduce emissions. The second thing that follows from this is that the term eco-innovation crucially depends on an overall assessment of environmental effects and risks. Life cycle assessment based on multi-attribute value theory can be used for such an assessment. We should note here that this approach may create a problem for survey analysis: the respondents’ assessment of whether an innovation is better than relevant alternatives on a life cycle basis need not be true. In fact, the knowledge may not be available or may crucially depend on how and where the innovation is used. Life cycle assessment (LCA) analyses been completed only for a handful of products and processes, in which restrictive assumptions have to be made about for example the intensity of use and re-use of materials. 10In 2008, the European Commission funded a project called MEI (Measuring Eco-Innovation) with the aim of developing a classification of eco-innovation. The resulting typology is summarised in Box A. 11The MEI classification of eco-innovation includes but is not limited to the important category environmental technologies. It includes organizational innovations for the environment and environmentally beneficial product and service innovations including innovations for which the environmental benefit is not a special aim. It also includes green system innovation, comprehensive changes in the systems of power supply, mobility, and food and agriculture. 12An alternative classification, highly relevant for policy, is whether or not the innovation is technologically radical and institutionally radical. 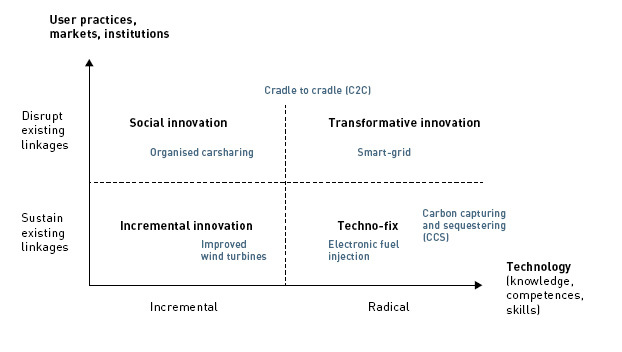 For example, smart grids are technologically and institutionally radical, electronic fuel injection systems are only technologically radical and organised car sharing is only institutionally radical (see Figure 1). Innovations that do not fit with existing rules and practices require changes in the institutional set up. Radical innovations usually come from outsiders. Barriers may be economic and institutional, an issue which is examined in section 3. 13Source: Author based on Clark (1985) and Arundel et al. (2011). Note: The plotting of eco-innovations is indicative and not based on metrics-based method. Over time the innovation may move upwards and to the right when it becomes more institutionally disruptive and technologically radical. 14The term eco-innovation supersedes the concept of environmental technology. The OECD is using it as a central concept within discussions on green growth, alongside the term sustainable manufacturing (OECD, 2008). For the European Commission, “eco-innovation is the natural junction of the pursuit towards sustainability, competitiveness and job creation” (European Commission, 2010, p.60). 15There are various rationales for the need for eco-innovation policy. These include market failure rationale and system failure rationale, each of which is composed of different elements. The market failure argument comes from neo-classical economics, which is concerned with efficient allocation of resources. 19market entry barriers and monopoly power working against innovation from challengers. 21While market failure provides a general rationale for policy intervention, it is inherently imprecise in its detailed prescription: a firm may spend too much or too little on innovation, it may innovate too quickly or too slowly, it may undertake excessively risky projects or be too conservative. 22Also eco-innovators may produce too much innovation but the danger of that is far smaller because eco-innovator suffers from perhaps an even more important market failure which is that the external costs of environmentally unfriendly alternatives are usually not internalised (reflected in the price), but transferred to society and the environment. In the case of eco-innovation, it is being said that we have two market failures (Rennings, 2000; Jaffe et al., 2005; Popp, 2006; Newell, 2010; Popp, 2010), one having to do with the public good nature of knowledge and one based on the non-internalisation of negative effects from economic activity. As to the problem of uncertainty, perhaps eco-innovation may suffer more from information problems than normal innovation. Consumers may distrust environmental claims or be unaware of environmental aspects. 23The market failure idea has been complemented by the system failure idea (Smith, 2000), referring to problems of technology infrastructure, technology capabilities acting as technology rigidities, and institutional inadequacies (in capital markets, organizations and public policy, see Table 1).3Within companies, conservative mindsets, lack of entrepreneurship and short-termism are believed to work against (non-incremental) innovation but there may also be more structural and broader factors acting against innovation such as lack of venture capital. 24The idea of system failure is based on a system-evolutionary view (Smith, 2000; Lipsey and Carlaw, 1998) of innovation dynamics that sees innovation activities as embedded in a system of knowledge generation, diffusion and use, with national innovation capacity being shaped by education and training systems, market conditions for factors and products, the macroeconomic and regulatory context (for a discussion with examples, see Kaiser and Prange, 2005). Within a structuralist evolutionary perspective, a country’s economic and environmental performance depends on capabilities, interaction effects and shaping conditions, as depicted in Figure 2. 25The dynamic aspects of interconnected processes of change are taken up in the literature about sustainability transitions, technological regime shifts and functions approaches of technology innovation systems (Kemp, 1994; Rip and Kemp, 1998; Jacobsson and Johnson, 2000; Geels, 2002, 2004; Elzen et al., 2004; Smith and Stirling, 2010; Grin et al., 2010). Within this literature, technology is situated in the contexts that enable it to work, which means that the focal concern is not just with artefacts, but with the structures, agents and processes that reproduce a ‘socio-technical practice’ (Smith and Stirling, 2010). The literature finds that “some socio-technical systems are embedded more robustly than others, in the sense that they enjoy greater institutional support, larger economic significance, more supportive infrastructures, better integration with other social practices, and broader political legitimacy” (Smith and Stirling, 2010). These factors can help some systems to survive—and even to expand—even when they impose a considerable cost upon society. 26A good example of lock-in is car-based modes of mobility, which cause carbon emissions, local air pollution, noise, congestion, traffic accidents and deaths, social exclusion, land fragmentation, and problems of oil dependence and energy security (Cohen, 2006). These problems are addressed in a partial and piecemeal manner. Examples include the requirement for seat belts to reduce injuries from collisions, unleaded petrol to prevent neural damage from lead poisoning, road pricing to deal with congestion (a measure which has proved difficult to implement), fuel injection systems to increase the efficiency of engines and emission control systems in the case of cars. A common feature of these examples is that the solution is found within the system of automobility and not in alternative systems of mobility. Technological alternatives must compete not only with components of an existing technology, but also with the overall system in which it is embedded (Smith, 2000, p.96). 27A special feature of environmental innovation is that the market for environmental innovation is largely a market commanded by environmental policy. In the case of environmental regulation in the form of emission limit values there are hardly any incentives for reducing environmental impact beyond what is legally required. Suppliers of environmental goods and services may speculate that better eco-technology will become mandatory, but this usually takes many years; it is estimated that it takes more than six years before standards are adapted to new technology (Krozer, 2002). In the case of a product ban or a ban of a dangerous substance, there is a strong incentive for innovation, as happened in the case of CFCs and PCBs, for which substitutes were developed in a short period of time. But such bans are rare. In the case of regulations that can be met by existing technology, positive incentives do exist for cost-saving environmental innovation. There is always an incentive for cost-reducing eco-innovation, whatever policy is used. 28Within the system failure perspective, it is knowledge barriers, institutional barriers and competition with old products that create problems for non-incremental innovation. The task for policy is to build effective innovation systems4 (Nelson, 2009). The focus is on knowledge, capabilities for innovation and institutions governing learning activities. Applied to eco-innovation, the problem is believed to lie with the innovation system, which is underdeveloped for eco-innovation or favouring incremental change over radical change. An innovation system comprises many things: the infrastructure of knowledge and access thereto, labs for testing and research, the knowledge transfers taking place in companies, universities and research institutes, and the regulations and customs that may promote or inhibit environmental innovation. Other forms of system failure are insufficient risk capital and high capital costs, insufficient entrepreneurship, lack of knowledge, resistance from users, and absence of complementary assets including infrastructure. System failure refers to a dysfunctional system of innovation. Environmental innovation suffers from both market failure and system failure. The distinction between these two types of failure is not always a sharp one. The system failure idea offers an important complement to the market failure idea, by drawing attention to more structural factors with their own path dependencies. 29Not every environmental innovation faces the same number of problems; particularly radical innovations with environmental benefits and green system innovations, which require change and adaptation at the supply and demand side and institutional framework, can be expected to face many problems. Radical innovations have uncertain yields and require a long period of development and long-term investment; they usually require the involvement of many actors for their development, creating problems of coordination of interdependent activities and problems of appropriating the benefits. 30Whereas there are good reasons for government involvement into the creation and diffusion of innovation, such attempts do not guarantee success in terms of positive outcomes. What this means is that we should also consider the possibility of “policy failure” (Malerba, 2009). The issue of policy failure is taken up in section 5 about effective governance. 32Although innovation has always been seen as part of the solution in environmental problems, prior to 2005 few programmes at the EU-level specifically addressed the stimulation of environmental innovations. There are two notable exceptions: first, the fairly small ACE-Programme (Action Communautaire pour l’Environnement), which ran from 1984-1991 with a total budget of 41 million euro; second, its successor, the LIFE-Programme (L’Instrument Financiel pour l’Environnement), which has been running since 1992, with a cumulative budget of well over 1.3 billion EUR (Faber et al., 2008, p.191). The LIFE-Programme is a broad tool for the implementation of the Union’s environmental policy. It subsidizes the demonstration of new technologies with positive effects on the environment, but it is not exclusively focussed on technologies or innovations, since, for example, nature conservation projects can apply for subsidy. Overall, almost 2500 projects were supported until 2004 (Faber et al., 2008, p.191). 33Over the past six years, eco-innovation has received growing attention. An important EU initiative in the field of environmental innovations is ETAP: the Environmental Technologies Action Plan. This strategic programme was adopted in January 2004. It is a joint initiative of DG Environment and DG Research (European Commission, 2004). ETAP seeks to exploit the potential of environmental technologies to improve both the environment as well as European competitiveness, thus contributing to growth and job creation. The actions in ETAP are mainly aimed at getting results from research more readily into the market. Following ETAP, some programmes of FP6 have been redrafted, funds have been made available by the European Investment Bank, and Technology Platforms on environmental domains have been established and stimulated. Furthermore, mutual learning between Member States in the area of financial instruments for the introduction of new environmental technologies into the market has been promoted (European Commission, 2004). 35All Member States have policies for eco-innovation. An overview of measures for all Member States is given in Figure 3 showing that there is a mix of policies. The measures fall into four areas. Within the area Getting research to the market, most of the support actions are in R&D support. For Improving market conditions, Member States also use a range of policies, the majority of which relate to regulation and raising environmental awareness. The relatively even distribution of policy instruments (measures) to improve market conditions suggests that there are few gaps in the policy portfolio, but a deeper analysis is required to really determine whether this is true. For Acting globally and Moving forward, there are far fewer policies. Acting globally is not a MS responsibility but an EU one. Moving forward is about improving ETAP and the Open Method of Coordination (for a discussion of internationalisation of research and the OMC, see Kaiser and Prange, 2005). There is no document discussing the theoretical basis for the policies, so we can only speculate about the link with market failure and system failure. R&D support fits with the view that the public good nature of knowledge and uncertainty led companies to underinvest in R&D (market failure issue about inappropriate incentives). Establishing innovation platforms is based on innovation system thinking. The policies under improving market conditions and acting globally aim to foster learning and encourage the uptake of innovations. They fit with proposals of evolutionary economists that the uptake of innovation is suboptimal, having to do with capabilities and inappropriate institutions. Moving forward is about coordination and thus about correcting system failure. Source: Kletzan-Slamanig et al (2009, p. 49), based on answers from ETAP Member State contacts to WIFO questionnaire in 2009. 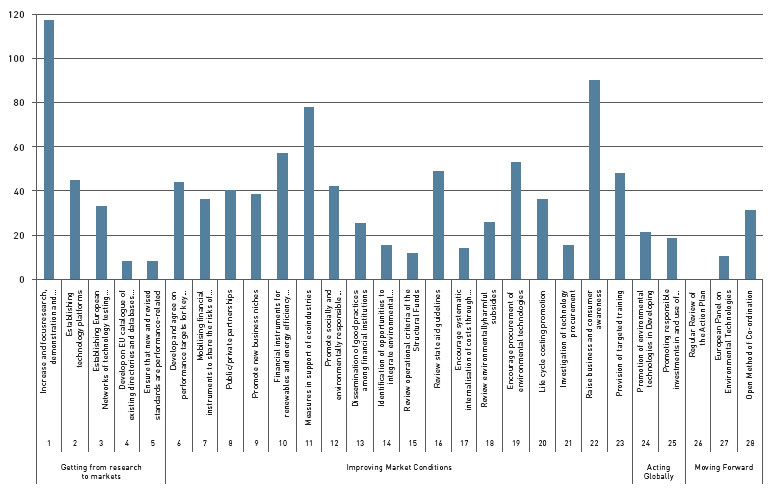 36In section 3, we examined the market failure and system failure rationales for eco-innovation policy. Both rationales have informed policy and have been used to legitimise policy by innovation policy makers and academics. There are different views as to what policy makers should do, and how. Neo-classical economists tend to be sceptical about the ability of government to overcome coordination failures but they support education policies, the support of start-up companies and experiments with new technologies, and the use of special capital market schemes for risky innovations. 37In general, neoclassical economists favour the use of generic subsidies policies for business R&D and other types of policies (such as R&D tax-breaks) that reduce the costs of research and of innovation. Although they are aware that for some project the subsidies may not be needed they still favour generic schemes because they think there is no way of discriminating between projects that need a subsidy in order to be undertaken and those that do not. They are in favour of decentralized decision making and wary of planning and regulation. 38Evolutionary-structuralists on the other hand see a need for specific support programmes, for example programmes for strategic technologies such as ICT and biotechnology, to assist companies in the transition towards new knowledge bases. They also believe that the government should improve the technology infrastructure, through technology transfer centres, education and training programmes, or by fostering ties between companies and research institutes. Neoclassical economists are critical of the possibility of government to formulate specific programmes and policies. They think that companies themselves are perfectly able to engage in cooperation with relevant knowledge holders and they are against horizontal cooperation (collaboration between competitors) because they believe this will undermine competition. 39The preference for focussed policies does not imply that evolutionary economists are against generic framework policies such as R&D subsidies; they are in favour of such policies but view these policies as rather blunt and insufficient. Across-the-board R&D subsidies will give rise to windfall gains. According to them, incentive policies should be targeted to areas and types of innovation for which the incentives are low. They also appear more sceptical about privatisation and the creation of markets for property rights because they fear that this might undermine the technology infrastructure. They attach great importance to public sector research institutes, universities and standards setting bodies, which are viewed as important elements of the technology infrastructure. 40This section tries to probe more deeply into some of the issues, through a discussion of ten themes of effective policy and effective governance. The focus is on eco-innovation, but most arguments and considerations apply to innovation support through government policies more generally. 41We have seen that not all innovations need government support. In general, incremental innovation does not need special support. In contrast, transformative innovations face a number of barriers, having to do with costs, uncertainty, problems of appropriation and the need for institutional change. To be effective and not wasteful, innovation policy should be based on identified barriers to particular types of eco-innovation instead of on abstract notions of market failure and system failure. This requires mechanisms for learning about those barriers. 42According to a recent Eurobarometer survey of 5,222 managers of small and medium-sized enterprises (SMEs) in the EU-27 Member States, uncertain demand from the market and uncertain return are the two biggest obstacles to eco-efficient innovations7, followed by lack of funds and unhelpful regulations (see Table 2). Lack of qualified personnel and technological capabilities is found to be a much important barrier than lack of cooperation with research institutes and universities. It would have been interesting to learn about the barriers to different types of eco-innovation but the survey did not examine this. It also did not make a distinction between process changes and product changes. It would also be interesting to compare the barriers for different types of eco-innovation with those for normal innovation, to gain information about specific problems faced by different types of eco-innovation. Source: Flash Eurobarometer 315 Attitudes of European entrepreneurs towards eco-innovation (Gallup, 2011). Answers are based on stated opinions of company managers. 45Support for innovation may be unnecessary and ineffective. A drawback of financial support policies is that projects receiving support would also be undertaken in the absence of support. An evaluation in 2002 of the Dutch WBSO scheme consisting of a subsidy on researcher costs revealed that in 72% of the cases where companies with more than 200 employees use the WBSO, the scheme had no impact on the carrying out of a project (see Table 3) (Brouwer et al., 2002). For companies with more than 50 employees, only 5% of the projects would not be carried out without the WBSO support. For smaller projects the “additionality” of support is significantly higher but still rather low: the WBSO support was a deciding factor in 19% of the projects. In about half of the projects the WBSO had some impact (e.g. with regard to the size and duration of a project). Source: Brouwer et al. (2002), Figure 2-5 p. 40. 46Technology-blind fiscal support for R&D, which is widely used, inevitably gives rise to windfall profits, by funding research that would have been done anyhow. Ways to reduce the windfall gains include relying on expert judgement as to whether innovation support is needed, or focussing on small firms for whom the additionality of innovation support has been shown to be higher, encouraging them to do an innovation project they would not have done otherwise or would have done in a less elaborate manner. 47Specific support for R&D has a bad name amongst economists, much more than the generic fiscal support policies, for the reason that “government cannot pick winners”. Whilst there is an element of truth in this, we have just seen that blind innovation and research support can be wasteful. In the case of specific support the additionality of support can be better considered, as well as the nature of other barriers. The need for support will differ over time and the challenge for policy is to discontinue support in time, something that may prove difficult because of uncertainty and pressure from special interests. In sectors where private R&D is low such as energy there is a need to support R&D. In areas of great inertia and long development times there is a need to support the creation of technology innovation systems – to achieve learning economies and foster learning and institutional change in the selection environment. Specific technologies such as algae-based fuels and organic solar cells suffer from specific barriers that no general support scheme can successfully address. Specific support for specific technologies is not about picking winners but about dealing with specific barriers. 48The requirement for co-funding by industry is one way of making sure that the technologies to be developed will not turn out to be “white elephants”. A possible model here is the public-private partnership model that is used in the German Clean Energy Partnership (CEP) for hydrogen and fuel cell vehicles, which was instrumental in the creation of the Ger­man National Innovation Programme Hydrogen and Fuel Cell Technology (NIP). For transport applications, 700 million EUR is available to pay for hydrogen fuel cell vehicles (HFCV) research and innovation projects for the 2007-2016 period, with half of this sum coming from industry. A National Development Plan specifies the agenda for technology development. To coordinate policy goals and implement projects on a more executive basis a special organization has been set up: National Organization for Hydrogen and Fuel Cell Technology (NOW), a quasi-governmental organization. NOW participates in all steering committee meetings and ensures that political imperatives are respected. NOW also makes sure CEP is aligned with related R&D and demonstration activities in Germany. Alignment of German activities with those abroad is achieved through international contacts with related organizations such as the EU Fuel Cells and Hydrogen - Joint Undertaking (based on Ehret and Dignum, 2010). 49In Germany, the government and the automobile industry are making a technological bet on HFCV, but the bet is a calculated bet based on the belief that future cars have to meet strict carbon emissions goals that internal combustion engines are unable to meet, thus necessitating electric drive systems or the use of biofuels. Of the different electric drive systems, hydrogen fuel cells are believed to be the most attractive option for users, as they comply with established preferences for range and comfort. It is entirely possible, of course, that the market for FCV will be small and that HFCV will be a white elephant, which is why we need multiple technology innovation mission programmes, a point further developed below. 50While R&D policy can help facilitate the creation of new environmentally friendly technologies, it provides little incentive to adopt these technologies (Newell, 2010, p. 263). Adoption, so important for post-innovation improvements, calls for demand-side measures but the incentives for innovation from market pull policies may be too weak or may favour particular types of technologies. Technologically non-challenging regulations merely stimulate cost-reducing innovation, and incentive-based environmental policies are found to stimulate the diffusion of existing technologies and marginally innovative change (Kemp, 2000; Kemp and Pontoglio, in press). For eco-innovation, there should be a balance between supply-side measures and demand-side measures (see Table 4). Innovation policy should work in tandem with environmental policy (Popp, 2006; Newell, 2010; OECD, 2011). Source: Edler and Georghiou (2007, p. 953), based on authors’ inventory of policy measures. 10 RD&D stands for Research, Development and Demonstration. 53There is a clear need for innovation policy to provide targeted support in areas where innovation is needed. One such area for eco-innovation is low-carbon technologies and systems. To reduce carbon emissions by the 80% that is needed according to the IPCC by 2050 will require cost-reducing innovation in carbon reduction technologies. According to the Energy Technology Perspectives report from the IEA (being the most authoritative study on the research, technology and innovation implications of climate change to date), there is a significant gap between the current level of investment in low-carbon technology RD&D and the investment needed to bring forward the technologies necessary for halving global energy-related CO2 emissions by 2050 (compared to 2005 levels) (IEA, 2010). Addressing this gap is said to require annual public-sector spending two to five times the current levels. The ETP 2010 study estimates the annual gap as between USD 40 and 90 USD billion, of which they say that half should come from public sources (IEA, 2010, p. 480). The most important target for RTD spending is advanced vehicles (battery electric vehicles, (plug-in) hybrid electric vehicles, hydrogen fuel cell vehicles and energy efficient internal combustion vehicles) where the ETP 2010 proposed additional annual spending between 26 and 43 billion USD. Current levels of annual public spending for low-carbon RD&D are estimated at 10 billion USD. This is just to show the magnitude of the RD&D efforts that are needed according to energy (innovation) experts. 54The Secretariat of the United Nations Framework Convention on Climate Change (UNFCCC) estimates that an additional 200 billion USD in global investment and financial flows will be required annually by 2030 just to return GHG emissions to current levels (UNFCCC, 2007, quoted in Newell, 2010, p. 254). 55Among innovation experts there is a discussion of whether persistent problems such as global warming warrant mission-oriented programmes. According to Keith Smith (2008, p. 2) the answer is yes: “We now require new large-scale “mission-oriented” technology programs for low- or zero emissions energy carriers and technologies, resting on public sector coordination and taking a system-wide perspective.” Others are sceptical of the usefulness of missions. According to innovation experts Mowery, Nelson and Martin (2010), global warming cannot be effectively dealt with through technology missions, because the challenge is not to develop technologies but to get innovations adopted, which is very much a matter of economics rather than technology. They do, however, believe that “strong, well-resourced government technology policy is part of the solution”. 56Superficially, the attention to missions seems like a return to the emphasis in the 1950s and 1960s on public goals to guide science and technology development. There is, however, a big difference between the old missions for environmentally sustainable development and the new: the older projects developed radically new technologies through government procurement projects that were largely isolated from the economy (Soete and Arundel, 1993, p. 51). Mission-oriented projects for sustainable development require the adoption of new technologies and practices across a wide range of sectors as well as changes in consumer demand and behaviour. This brings many actors into the process and will require a range of policies and customised solutions to deal with the many barriers. Economic feasibility is a key condition, together with social acceptability. An overview of the difference between old and new mission policies is given in Table 5. The mission is defined in terms of the number of technical achievements with little regard to their economic feasibility. The mission is defined in terms of economically feasible technical solutions to particular environmental problems. The goals and the direction of technological development are defined in advance by a small group of experts. The direction of technical change is influenced by a wide range of actors including the government, private firms and consumer groups. Centralised control within a government administration. Decentralised control with a large number of involved agents. Diffusion of results outside the core of participants is of minor importance or actively discouraged. Diffusion of the results is a central goal and is actively encouraged. Limited to a small group of firms that can participate owing to the emphasis on a small number of radical technologies. An emphasis on the development of both radical and incremental innovations in order to permit a large number of firms to participate. Self-contained projects with little need for complementary policies and scant attention paid to coherence. Complementary policies vital for success and close attention paid to coherence with other goals. 59The experiences in the Netherlands and the UK (described in Parkhurst et al., in press) suggest that transport intermodality will rarely emerge as a significant phenomenon without national government support and active involvement of various actors (public transport companies, parking companies, real estate companies and local authorities). Even in the Netherlands, where transport coordination is more possible, major organizational barriers exist, such as the fragmented systems of mobility providers and public transport concessions. To overcome these barriers and promote sustainable mobility, the authors believe a long-term coordinated approach is necessary involving several of the following elements: implementation of convenient car-public transport interchanges; bicycles for short-term rental that are integrated with public transport; integrated ticketing across different transport modes; dynamic information and booking services, and individualized demand-responsive forms of public transport that provide links to scheduled public transport (from Parkhurst et al., in press). 60The development of enabling technologies such as smart grids and innovations such as eco-friendly driving, modular vehicles and intermodal travel requires strategic intelligence. The report Towards a 50% more efficient road transport system by 2030 the European Road Transport Research Advisory Council (ERTRAC, 2010), analyses how the transport sector can be made more energy-efficient, cut carbon emissions, become more safe, reliable and efficient from a logistical point of view. The vision is based on the following concepts: eco-friendly driving; safe and smart driving; basic, affordable vehicles; passenger comfort; modularity; terminal efficiency; driver and transport efficiency; logistics efficiency; cost-effective vehicles; and vehicle efficiency. 61Technology assessment, foresight, evaluation and benchmarking are tools or sources of strategic intelligence (Smits and Kuhlmann, 2004). Such exercises can be linked to innovation and can also be used for policy coordination so important for radical eco-innovations. It is important that the whole range of innovative solutions is considered, including social innovations (e.g. in the domain of transport, an example of a social innovation is organised car-sharing, where people do not own a car and, because of this, do not use a car for most of their trips). There is also a need for assessing sustainability benefits of green (system) innovations and sustainability claims of different actors. 62For sustainable development and green growth it is advisable that government support be given to a broad portfolio of options, to widen the search process, which often is unduly narrow, focussing on the most economic options, which tend to be in the prevailing technological paradigm. There should also be a good mix between low-risk and high-risk projects. It is especially important that also radical, disruptive technologies are being supported and not just options which help to make present systems greener (it is equally important that one does not rely too strongly on long-term solutions as they may remain a long-term solution, nuclear fusion being an example of this). By relying on adaptive portfolios, two possible mistakes of sustainable energy policy may be prevented: 1) the promotion of short-term options resulting from the use of technology-blind generic support policies such as carbon taxes or cap and trade systems (which despite being “technology-blind” are not technology neutral at all because they favour low-hanging fruit and regime-preserving change (Jacobsson et al., 2009)), and 2) picking losers (technologies and system configurations which are suboptimal) through technology-specific policies. 63In this connection we want to mention the Communication from the European Commission “Investing in the Development of Low Carbon Technologies” (European Commission, 2009) which sets out a portfolio approach, called the European Strategic Energy Technology Plan (SET-Plan). SET-Plan is the technology pillar of the EU’s energy and climate change policy. 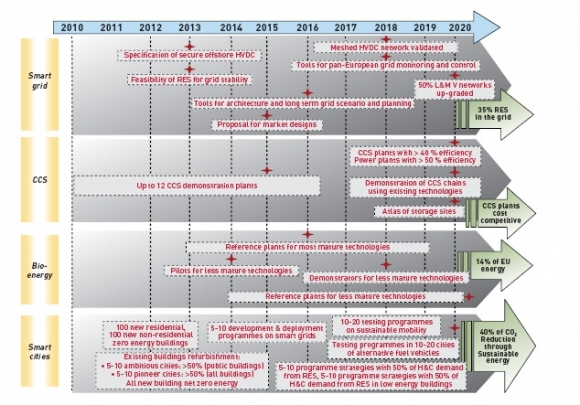 SET-plan proposes an increase in private and public investments in low-carbon technologies from 3 billion EUR to 8 billion EUR in the next year, or an additional 50 billion EUR over the ten years from 2010 to 2020. 64SET-plan proposes appropriate spending for a number of European industrial initiatives, based on estimates of what is needed for achieving the EU climate and energy targets for 2020. SET-plan involves six European Industrial Initiatives (on Solar Energy, Bioenergy, Wind Energy, CCS, Smartgrids, and Sustainable Nuclear Fission) and the Smart Cities initiative. Each initiative has set itself a target for 2020 and has established a Technology Roadmap and Implementation Plan with milestones. Milestones for the smart grid, CCS, bio-energy and smart cities are given in Figure 4. 66Uncertainty prevails with respect to innovation as well as to what innovation policy can or will achieve (Nauwelaers and Wintjes, 2008, p. 226). Uncertainty as to the effects of policy instruments call for policy learning. Experience with innovation policy making in European Member States shows that policies are usually a follow-up on existing policies (Nauwelaers and Wintjes, 2008). Official research-based evaluations play a limited role in innovation policy, as policy instruments are seldom evaluated for their effectiveness and efficiency (Nauwelaers and Wintjes, 2008). There is a need for lessons learned by executive agencies and evaluators of effective governance to be disseminated internationally (Kaiser and Prange, 2005; Borrás, 2009). The European Action Plan for Eco-innovation, the successor of ETAP (the European Action Plan on Environmental Technologies), could be used for this purpose. Within the ETAP roadmap exercise, governments were asked to indicate which policies were successful and what lessons had been learned. Better exchange of experiences can help the national road maps to become an agent for change. At the moment, the roadmap process is more a formal requirement than a vehicle for change. 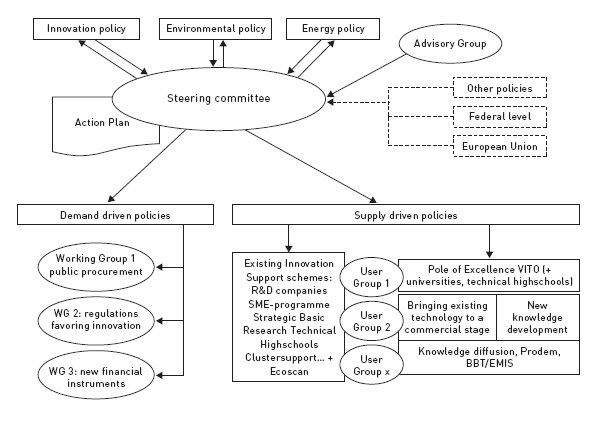 Only in Germany has the roadmap for ETAP been externally assessed by innovation policy experts. The roadmap is currently being updated in two countries (Romania and Sweden) and updates are planned in six countries (Cyprus, Denmark, Hungary, Ireland, Poland and Portugal) and possibly France (based on Kletzan-Slamanig et al., 2009). 67Since the effects of policies depend on the characteristics of the policies and the context in which they are applied (Kemp and Pontoglio, in press; OECD, 2011), contextual features and design features should be incorporated in the evaluation of eco-innovation policies (OECD, 2011). Evaluations should also consider policy interaction effects (Kivimaa, 2008; Ringeling, 2005). 68Policy coordination is a difficult issue for which there are no simple solutions (Braun, 2008). In the case of eco-innovation, there is a strong need for horizontal policy coordination, i.e. 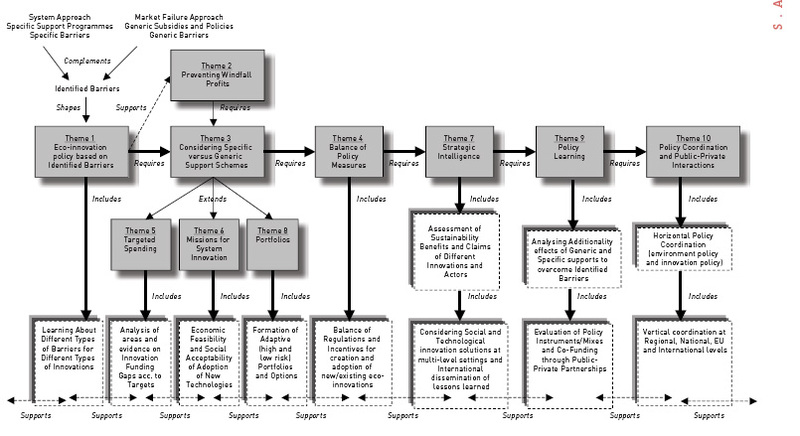 to align environmental policy with innovation policy, and a need for vertical policy coordination (across layers of government), each of which comes with problems (Schrama and Sedlacek, 2003). Up until now innovation policy is very much a national responsibility, despite the growing importance of regional and supra-national innovation policy (Kaiser and Prange, 2005). European innovation policy is primarily focused on the promotion of international cooperation in R&D. The European Research Area and SET-plan for low-carbon energy technologies are attempts at internationalisation of research and innovation. The EU has formulated programmes for eco-innovation and for various kinds of eco-innovation, technology platforms have been created at the EU level. The platforms serve a useful role in agenda-setting and coordination of research work at the European level, but their privileged position vis-à-vis EU policy makers can be a problem from a public interest point of view. To deal with the problem of special interests, Borrás (2009) suggests that the roles and risks between public and private actors in complex public-private interactions should be defined. Risks and public concerns are also to be considered in innovation policy, to enhance public legitimacy and secure good results. 69In Flanders in Belgium a vehicle for policy coordination is the eco-innovation platform (Milieu-innovatie platform, MIP), described in Dries et al. (2006) and illustrated in Figure 5. Created in 2004, the mission of the platform is to “activate innovation synergies between relevant private and public actors”. Policy instruments of three ministerial domains will be “pooled” on a common goal, using a “non-hierarchical” way of networking of ministries and administrations. Demand-driven policies are coordinated with supply-driven policies through a steering committee and various working groups (Dries et al., 2006, p.258). 70According to the evaluation of Dries et al. (2006), the aspect of interactive policy making and transparency should be strengthened, together with processes for creating strategic intelligence. Furthermore, the policy mix should be broadened and the policy focus on system innovation should be widened. 71Further research is needed on the need for policy coordination in areas of water, waste and carbon reduction and energy efficiency. An area for which policy frameworks are weakly developed is sustainable resource management, being a new topic for policy. Details of sustainable resource management are currently being worked out by UNEP’s International Resource Panel in terms of a multi-level framework to dematerialize society. Dematerialization helps to reduce negative environmental impacts, reduce vulnerability to price volatility of scarce materials, avoid resource-based conflicts and make a transition to a low-carbon economy (renewable energy technologies depend on scarce materials) (Bleischwitz et al., 2010). Practical policies for international sustainable resource management need to be worked out, with real policies and frameworks to be tested out and adapted with experience. 72In this paper, we offer a discussion of the rationales for eco-innovation policy and discuss issues of instrument choice and coordination. One important conclusion is that the case for eco-innovation policy is stronger than for normal innovation because the benefits of eco-innovation are undervalued in the market place and because of problems of lock-in to well-developed and well-embedded technologies in power supply and transport. Markets are a poor selection mechanism for eco-innovation because prices do not reflect environmental costs and cannot be easily made to do so. Especially for green energy, the low costs of fossil fuels, long lead times, as well as issues of connection, disadvantage innovations that do not fit in the current paradigm, calling for specific support policies for green innovations outside existing technological paradigms. Eco-innovation may be fostered through generic policies for improving the national (and regional) system for (eco)-innovation and through technology-focussed policies for specific technology innovation systems. 73Different types of eco-innovation require different policies. In general, incremental improvements of commercial products do not require special support. Companies are perfectly capable of producing and funding these. Radical innovations and system innovation are much more in need of support, but the barriers to them and the level of support needed will differ. Radical innovations that are transformative require more support than technical fixes for problems of well-established regimes. Support for transformative innovation should go beyond the financial as it requires institutional change in the economic and social world. 74For dealing with the grand challenges of climate change and energy/resource security, EU policy makers have expressed an interest in “mission” policies (without using the word mission). In the author’s view, there is a role for innovation missions, but the key challenge is not to develop technologies but to get innovations adopted, which is very much a matter of economics, institutional change and appropriate designs rather than an issue of technology development. To avoid lock-in, the missions should be based on a portfolio of technologies with the innovations subjected to ongoing evaluation, to circumvent policy capture by special interests, an issue which is given little attention in current discussions on eco-innovation policy. In general, eco-innovation policy is very much oriented towards high-technology options, as a result of demand from actors (companies and researchers) interested in those options. There is a danger that the portfolio of eco-innovation options is too narrow and unbalanced (see Nill and Kemp, 2009; OECD, 2011). 75Whilst market failure and system failure provide reasons for public intervention, actual interventions may be a “failure” too. Innovation policy does not lend itself easily to rational choice, because of uncertainty and information asymmetries between policy makers and actors in industry and research. Policy should evolve with experience and involve critical evaluation of the system of innovation governance in which policy choices are made. It is important that policy should not be viewed purely in instrumental terms but as a trajectory in itself (see Voss, 2007). To successfully carry out a transition towards more environment-benign energy resources and to better utilize material resources through energy saving technologies and recycling will require a forward-looking process of adaptive policy making. The need for information in the policy process puts a premium on feedback and flexibility in the design of strategies and policies for eco-innovation – to avoid “policy failure”. 76To make effective policies it is necessary that government officials have a correct understanding of eco-innovation barriers and of innovation dynamics in general. Blind technology support, favoured by economists, is found to generate windfall profits to recipients and to be unsuccessful in stimulating radical change. The case for fiscal policies appears to be weaker than the case for specific (focussed) innovation policies. In the author’s opinion, more support should be given to transformative innovation, something that requires long-term policy and a good deal of policy coordination. 77The overall conclusion is that eco-innovation policy should be more concerned with its own functioning. The ten themes may help to do this by bringing into focus relevant issues for policy. As shown by Figure 6, the themes are not just separate themes but are inter-linked. Effective policy depends on effective governance, both of which depend on policy learning and the creation of strategic intelligence. Arundel, A., M. Kanerva & R. Kemp (2011). Integrated Innovation Policy for an Integrated Problem: Addressing Climate Change, Resource Scarcity and Demographic Change to 2030. PRO INNO Europe: INNO-Grips II report. Brussels: European Commission, DG Enterprise and Industry. Bergek, A. et al. (2008). Analyzing the functional dynamics of technological innovation systems: a scheme of analysis. Research Policy 37(3): 407-429. Bleischwitz, R. et al. (2009). Eco-innovation – putting the EU on the path to a resource and energy efficient economy. (Wuppertal Spezial 38.) Wuppertal: Wuppertal Institute. Bleischwitz, R., P.J.J. Welfens & Z.X. Zhang (2010). Introduction of special issue “The international economics of resources and resource policy”. International Economics and Economic Policy 7: 147–151. Borrás, S. (2009). The Widening and Deepening of Innovation Policy: What Conditions Provide for Effective Governance. CIRCLE Electronic Working Paper Series Paper no. 2009/02. Braun, D. (2008). Organising the political coordination of knowledge and innovation policies. Science and Public Policy 35: 227-239. Brouwer, E. et al. (2002). WBSO nader beschouwd, onderzoek naar de effectiviteit van de WBSO. PWC/ Dialogic/ TU Delft, Utrecht. Clark, K. (1985). The interaction of design hierarchies and market concepts in technological evolution. Research Policy 14: 235-251. Cohen, M. (2006). A social problems framework for the critical appraisal of automobility and sustainable systems innovation. Mobilities 1: 23–38. Dries, I., J. Larosse & P. Van Humbeeck (2006). Linking innovation policy and sustainable development in Flanders. In: Governance of Innovation Systems: Case Studies in Cross-Sectoral Policy, pp. 245-270. Paris: OECD. Edquist, C. (2004). Systems of innovation, perspectives and challenges. In: J. Fagerberg, D. C. Mowery, R.R. Nelson (Eds.) The Oxford Handbook of Innovation, pp. 181-208. Oxford: Oxford University Press. Ehret, O. & M. Dignum (2010). Introducing hydrogen and fuel cell vehicles in Germany. In: F. Geels, R. Kemp, G. Dudley and G. Lyons (Eds.) Automobility in Transition? A Sociotechnical Analysis of Sustainable Transport. London: Routledge. Elzen, B., F.W. Geels & K. Green (Eds.) (2004). System Innovation and the Transition to Sustainability: Theory, Evidence and Policy, Cheltenham: Edward Elgar. Edler, J. & L. Georghiou (2007). Public procurement and innovation—resurrecting the demand side. Research Policy 36: 949–963. European Commission (2004). Stimulating technologies for sustainable development: an environmental technologies action plan for the European Union. Communication from the Commission, COM(2004) 38 final. Brussels. European Commission (2007). A European Strategic Energy Technology Plan (SET-Plan): Full impact assessment. Commission Staff Working Paper. SEC(2007) 1508, COM(2007) 723 final. Brussels, 22.11.2007. European Commission (2009). Investing in the development of low carbon technologies (SET-Plan). Communication from the Commission to the European Parliament, the Council, the European Economic and Social Committee and the Committee of the Regions. COM(2009) 519 final. Brussels, 7.10.2009. European Commission (2010). Rationale for Action, Commission Staff Working Paper, accompanying document Europe 2020 Flagship Initiative Innovation Union, SEC(2010) 1161, Brussels, 6.10.2010, COM(2010) 546 final. Faber, A., R. Kemp & G. van der Veen (2008). Innovation policy for the environment in the Netherlands and EU. In: C. Nauwelaers, R. Wintjes (Eds.). Innovation Policy in Europe. Measurement and Strategy, pp. 171-202. Cheltenham: Edward Elgar. Gallup (2011). Flash Eurobarometer 315 Attitudes of European entrepreneurs towards eco-innovation, Survey conducted by The Gallup Organization, Hungary upon the request of Directorate-General Environment of the European Commission. Gassler, H., W. Polt & C. Rammer (2008). Priority setting in technology policy. Historical developments and recent trends. In: C. Nauwelaers, R. Wintjes (Eds. ), Innovation Policy in Europe. Measurement and Strategy, pp. 203-224. Cheltenham: Edward Elgar. Geels, F.W. (2002). Technological transitions as evolutionary reconfiguration processes: a multi-level perspective and a case-study, Research Policy 31(8-9): 1257-1274. Geels, F.W. (2004), From sectoral systems of innovation to socio-technical systems: Insights about dynamics and change from sociology and institutional theory, Research Policy 33(6-7): 897-920. Geels, F.W. & R.P.J.M. Raven (2007). Socio-cognitive evolution and co-evolution in competing technical trajectories: Biogas development in Denmark (1970-2002). International Journal of Sustainable Development & World Ecology 14(1), 63-77. Grin, J. et al. (2010). Transitions To Sustainable Development. New Directions in the Study of Long Term Transformative Change, New York: Routledge. Guy, K. & C. Nauwelaers (2003). Benchmarking STI policies in Europe: in search of good practice. In: The IPTS Report, No. 71. Sevilla: IPTS. Hekkert, M.P. et al. (2007). Functions of innovation systems: a new approach for analyzing technological change. Technological Forecasting and Social Change 74(4): 413-432. Henderson, R. & R.G. Newell (2010). Accelerating Innovation In Energy: Insights from Multiple Sectors (Harvard Business School working paper 10-067). IBO (2002). Samenwerken en stroomlijnen: opties voor een effectief innovatiebeleid. Eindrapportage Interdepartementaal Beleidsonderzoek (EZ-02-311), Den Haag. IEA (2010). Energy technology perspectives 2010. Paris: OECD and IEA. Jacobsson, S. & A. Johnson (2000). The diffusion of renewable energy technology: an analytical framework and key issues for research. Energy Policy 28: 625-640. Jacobsson, S. et al. (2009). EU renewable energy support policy: faith or facts? Energy Policy 37: 2143-2146. Jaffe, A.B., R.G. Newell & R.N. Stavins (2005). A tale of two market failures: Technology and environmental policy. Ecological Economics 54(2-3): 164-174. Kaiser, R. & H. Prange (2005). Missing the Lisbon target? Multi-level innovation systems and the challenge for EU policy coordination. Journal of Public Policy 25(2): 241-263. Kemp, R. (1994). Technology and the transition to environmental sustainability. the problem of technological regime shifts. Futures 26(10): 1023-46. Kemp, R. (2000). Technology and environmental policy—innovation effects of past policies and suggestions for improvement. In: OECD proceedings Innovation and the Environment, pp. 35-61. Paris: OECD. Kemp, R. & P. Pearson (2008). 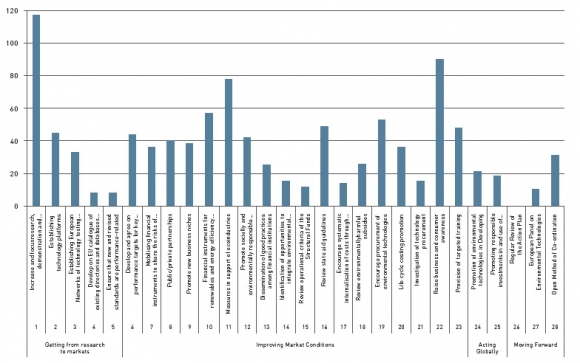 Measuring eco-innovation (Final Report MEI project). Maastricht: UNU-MERIT. Kemp, R. & S. Pontoglio (in press). The innovation effects of environmental policy instruments—A typical case of the blind men and the elephant?, submitted to Ecological Economics. Kemp, R. & S. Zundel (2007). Environmental innovation policy: Is steering innovation processes possible? In: M. Lehmann-Waffenschmidt (Ed. ), Innovations Towards Sustainability. Conditions and Consequences, pp. 25-46. Heidelberg, New York: Physica Verlag. Kivimaa, P. (2008). The innovation effects of environmental policies: linking policies, companies and innovations in the Nordic pulp and paper industry. Acta Universitatis Oeconomicae Helsingiensis A-329, Helsinki School of Economics. Kletzan-Slamanig, D et al. (2009). Assessment of ETAP roadmaps with regard to their eco-innovation potential. Technical Report 2: Country fiches for the ETAP roadmaps. Vienna: Austrian Institute of Economic Research (WIFO). Krozer, Y. (2002). Milieu & Innovatie. PhD Thesis. Rijksuniversiteit Groningen, Groningen. Lipsey, R. & K. Carlaw (1998). Technology policies in neo-classical and structuralist-evolutionary models. STI Review 22: 31-73. Lundvall, B. & S. Borrás (1998). The Globalising Learning Economy: Implications for Innovation Policy. Luxembourg: Office for Official Publications of the European Communities. Lundvall, B.-A. & M. Tomlinson (2002). International benchmarking as a policy learning tool. In: M.J. Rodrigues (Ed.) The New Knowledge Economy in Europe, pp. 203-231. Cheltenham: Edward Elgar. Malerba, F. (2009). Increase learning, break knowledge lock-ins and foster dynamic complementarities: evolutionary and system perspectives on technology policy in industrial dynamics. In: D. Foray (Ed.) The New Economics of Technology Policy, pp. 33-45. Cheltenham: Edward Elgar. Metcalfe, J.S. & L. Georghiou (1998). Equilibrium and evolutionary foundations of technology policy. STI Review 22: 75-100. Mowery, D.C., R.R. Nelson & B.R. Martin (2010). Technology policy and global warming: why new policy models are needed (or why putting new wine in old models won’t work). Research Policy 39(8): 1011–1023. Mytelka, L.K. & K. Smith (2002). Policy learning and innovation theory: an interactive and co-evolving process. Research Policy 31(8-9): 1467-1479. Nauwelaers, C. & R. Wintjes (2008). Innovation policy, innovation in policy: policy learning within and across systems and clusters. In: C. Nauwelaers & R. Wintjes (Eds. ), Innovation Policy in Europe. Measurement and Strategy, pp. 225-268. Cheltenham: Edward Elgar. Nelson, R.R. (2009). Building effective ‘innovation systems’ versus dealing with market failures as ways of thinking about technology policy. In: D. Foray (Ed.) The New Economics of Technology Policy, pp. 7-16. Cheltenham: Edward Elgar. Newell, R.G. (2010). The role of markets and policies in delivering innovation for climate change mitigation. Oxford Review of Economic Policy 26(2): 253–269. Nill, J. & R. Kemp (2009). Evolutionary approaches for sustainable innovation policies: from niche to paradigm? Research Policy 38(4): 668-680. OECD (1999). Managing National Systems of Innovation. Paris: OECD. OECD (2005) Oslo Manual. The measurement of scientific and technological activities. Proposed guidelines for collecting and interpreting technological innovation data. Paris: OECD. OECD (2008) Sustainable manufacturing and eco-innovation. First steps in building a common framework. DSTI/IND(2008)16/REV1. Paris: OECD. OECD (2011). Better Policies to Support Eco-innovation. OECD studies on Environmental Innovation. Paris: OECD. Parkhurst, G. et al. (in press). Intermodal personal mobility: A niche caught between two regimes. In: Geels, F.W., R. Kemp, G. Dudley, G. Lyons (Eds.) Automobility in Transition? A sociotechnical analysis of sustainable transport. London: Routledge. Pontoglio, S. (2010). An early assessment of the influence on eco-innovation of the EU emissions trading scheme: evidence from the Italian paper industry. In: Mazzanti M., Montini A (Eds.) Environmental Efficiency, Innovation and Economic Performances, pp. 81-91. London: Routledge. Popp, D. (2006). R&D subsidies and climate policy: is there a ‘free lunch’? Climatic Change 77 (3-4): 311-41. Popp, D. (2010). Innovation and Climate Policy, NBER Working Paper No. 15673. Remøe, S.O. (2008). Innovation governance in dynamic economies. Lessons from the OECD MONIT project. In: C. Nauwelaers & R. Wintjes (Eds. ), Innovation Policy in Europe. Measurement and Strategy, pp. 139-170. Cheltenham: Edward Elgar. Rennings, K. (2000). Redefining innovation: eco-innovation research and the contribution from ecological economics. Ecological Economics 32: 319-332. Ringeling, A.B. (2005). Instruments in four: the elements of policy design. In: P. Eliadis, M.M. Hills, M. Howlett (Eds), Designing Government: From Instruments to Governance, pp. 185-202. Kingston, Ontario: McGill-Queens University Press. Rip, A. & R. Kemp (1998). Technological change. In: S. Rayner and L. Malone (Eds. ), Human Choice and Climate Change, pp. 327-399. Washington D.C.: Batelle Press. Rogge, K., M. Schneider & V.H. Hoffmann (2010). The innovation impact of EU emission trading – findings of company case studies in the German Power Sector. Fraunhofer ISI Working Paper Sustainability and Innovation No. S 2/2010. Sartorius C. & S. Zundel (Eds.) (2005), Time Strategies, Innovation and Environmental Policy. Advances in Ecological Economics. Cheltenham: Edward Elgar. Schrama, G.J.I. & S. Sedlacek (2003). Environmental and Technology Policy in Europe. Technological Innovations and Policy Integration. Dordrecht: Kluwer Academic Publishers. Smith, K. (2000). Innovation as a systemic phenomenon: rethinking the role of policy. Enterprise & Innovation Management Studies 1(1), 73-102. Smith, K. (2008). Climate change and radical energy innovation: the policy issues. Report to Garnaut Commission on climate Change, Australia. Smith, A. & A. Stirling (2010). The politics of social-ecological resilience and sustainable socio-technical transitions. Ecology and Society 15(1): 11. Smits, R. & S. Kuhlmann (2004). 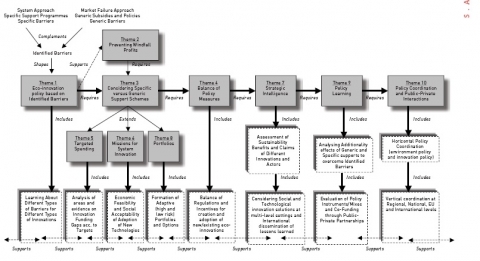 The rise of systemic instruments in innovation policy. International Journal of Foresight and Innovation Policy 1(1/2): 4-32. Soete, L. & A. Arundel (1993). An integrated approach to European innovation and technology diffusion policy: a Maastricht memorandum. Publication EUR 15090. Brussels: EU. Steward, F. (2008). Breaking the boundaries. Transformative innovation for the global good, NESTA provocation 07, April 2008. UNEP (2011), Decoupling natural resource use and environmental impacts from economic growth: A Report of the Working Group on Decoupling to the International Resource Panel, M. Fischer-Kowalski et al. (Authors). Nairobi, Kenya: UNEP. Unruh, G.C. (2000). Understanding carbon lock-in. Energy Policy 28: 817-830. Voss, J.-P. (2007). Designs on Governance. Development of Policy Instruments and Dynamics in Governance. PhD Thesis, University of Twente. Zundel, S. et al. (2005), Conceptual Framework, In: C. Sartorius & S. Zundel (Eds.) Time Strategies, Innovation and Environmental Policy. Advances in Ecological Economics, pp.10-51. Cheltenham: Edward Elgar. 1 “Normal” innovations are developed for normal market reasons of saving costs or providing better services to users. 3 In case of great rigidities, it is common to talk about lock-in. Unruh (2000) argues that fossil-fuel based energy systems have undergone processes of reinforcing adaptations leading to the current dominance of high carbon technologies and the accumulated knowledge, capital outlays, infrastructure, available skills, production routines, social norms, regulations and life styles which support these, which he calls carbon lock-in. 4 The literature on innovation systems is replete with definitions (Edquist, 2004). In a recent book on technology policy, Richard Nelson defines an innovation system as “the complex and varied set of actors and arrangements that, through the action and interactions they engender and mold, influence the pace and pattern of technological innovation in a field” (Nelson, 2009, p. 11). The field can be national, sectoral, regional or technology-specific. 5 Presentation From ETAP to Eco-Innovation Action Plan from Timo Mäkelä, Director DG ENV Directorate E International Affairs, LIFE and eco-innovation on 11 Feb. 2010 in Brussels). 7 My term for the eco-innovations studied in the survey, being new or substantially improved solutions resulting in more efficient use of materials, energy and water. 9 According to the functions approach, the development of an emerging technology innovation system (such as solar PV) depends on the well-functioning of seven functions: knowledge development, knowledge diffusion, resource mobilisation, research guidance, entrepreneurial activity, market development and legitimacy (societal support) (Hekkert et al., 2007).